The pursuit of excellence in covering race and ethnicity begins with a conversation about diversity, the umbrella under which these issues reside. It’s critical, then, to have a shared definition of what diversity means and a clear articulation of why it’s relevant to journalism. Both may seem obvious, but the reality is that people bring wildly differing answers to the questions of “what?” and “why?” depending on education, age, life experience, and myriad other factors. There’s no universal answer to either question, but journalism’s values of accuracy, truth, precision, and fairness provide excellent guidance. Diversity is inclusion and covering the under-covered and mitigating bias and prejudice. Each piece of the definition is a response to the perennial challenges journalists face in telling complete, complex, fair, and accurate stories about the people they serve. 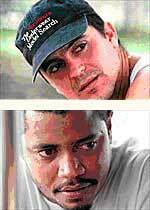 Achmed Valdés, top, and Joel Ruiz, bottom. In America, they discovered race matters. Photo: Librado Romero/The New York Times for Best of Friends, Worlds Apart, a series by Mirta Ojito. * Inclusion is about consciously bringing people and issues into news coverage because they would otherwise be excluded. That exclusion may result from intentional decisions or the unintentional consequences of actions taken by individual journalists, the organizations that employ them, or the ways the larger society organizes itself. Whatever the cause, leaving people out of coverage paints an incomplete picture for the audience. Who’s excluded from coverage and in what ways? In some cases, it can be whole communities that go unexplored until things go wrong. Too often, but not always, those communities are impoverished or working class and made up of racial and ethnic minorities. Poor white people are included in coverage of disasters but little else. Also excluded: People who don’t have fax machines, e-mail addresses, Websites, blogs, or telephones. And, in general, people who fall beyond the mainstream of faith, sexuality, and the socioeconomic continuum. Inclusion here is action: It means we seek people out to get them into the full range of our storytelling for the sake of a more complete report. It means we bring people into stories that are not just about their difference, stories that make up the fabric of daily journalism beyond social pathology, conflict, and entertainment: national politics, international affairs, parenting, education, the technological and communications revolutions, tax reform, and so on. We feature them in stories about all those ordinary things. Yes, bring people in because some sort of difference has kept them out but include them because they share a common humanity with everyone else. * Covering the under-covered means telling stories that otherwise go untold. Here, journalists recognize that many people—often blue-collar and poor people across racial and ethnic lines—fly below the radar of daily journalism. They can be separated from the media linguistically, socially, culturally, or, sometimes, geographically. They aren’t covered by any particular beat and thus show up most often in breaking news stories about crime, disasters, or other social pathologies. Their untold stories, though, reveal a much wider and complex range of truths about the neighborhood. To get to these stories, journalists need to position themselves in these communities, establish listening posts, find guides to lead them to sources, spend the time to unearth a more complete picture of a neighborhood. That might mean creating a specialized beat or—like newspapers in San Jose, California, Fort Lauderdale, Florida, and Washington, D.C.—a race and demographics beat. Jodi Rave, who covers Native American issues for Lee Enterprises Newspapers, brought the Broken Trust story to light by working listening posts in Native communities. The better journalists are at finding such stories, the greater the chance people in these communities can be included in the more routine stories we tell. Covering the under-covered need not be an exercise in finding the “difference of the week” story, as some news organizations have done. The media need not abandon the rigors of journalism to tell good news stories about these communities. As journalists such as Allie Shahin Minneapolis or Anne Hull in Washington, D.C., have proven, the best stories about difference are grounded in strong reporting and, in many cases, the universal themes that any reader, listener, or viewer would recognize from their own lives. * Mitigating bias and prejudice begins with the presumption that all journalists bring biases with them to work each day. We know more about some groups than we do about others. We’re more comfortable in familiar settings, less so in strange places, especially when we stand out because of race, ethnicity, class, or gender. We’re afraid to go to some neighborhoods or talk candidly about those fears. We often have strong feelings about matters of race and ethnicity, about claims of discrimination and racism, about the conditions of our communities and how they came to be that way. In that cauldron of discomfort, ignorance, fear, and opinion reside the biases and prejudice that show up in story choices, the framing of those stories, the decisions we make about which words, photos, and video to use to tell a story. When a Hmong hunter shot and killed a white man in the Wisconsin woods, some journalists were predisposed to assume that culture would explain the man’s actions. Initial stories implied that the shooting stemmed from ancient Hmong traditions of recognizing no property lines when hunting. In the end, the hunter, a U.S. citizen for a quarter century, said he fired because a group of white men were threatening him and hurling racial slurs at him. To do justice to diversity in storytelling, journalists need to build an awareness of their own biases and guard against them at every stage of the journalistic process—from story inception to the final edits before publication or broadcast. * Because we want to reflect the reality of our increasingly diverse communities. * Because a more diverse newsroom can do a better job of covering the whole community. * Because a news report with greater diversity will attract a more diverse audience. Those reasons describe an ideal and, in many ways, prescribe a solution: Hire a more diverse staff and increase the breadth and depth of coverage of the whole community. But there’s more to the question “why?” that would make the problem clearer and the answer more complete. To understand why journalism needs to focus on diversity, we need to look to the past and the present, not just to the future. In the past is a history of exclusion, distortion, and neglect—in the profession and in the larger society—that affects the way communities regard journalism and, often, each other. Distorted and biased reporting about racial and ethnic groups has damaged relationships among communities, often creating or exacerbating racial and ethnic distrust and animosity. In the present is a set of unrelenting factors that perpetually threaten to undermine the better intentions of the media: our individual limits, the organizational structures of our news-gathering operations, and the societal segregation that persists into the new millennium. * As individuals, we are beset with biases, prejudice, and the kinds of blind spots ABC Nightline’s John Donvan and former Nightline anchor Ted Koppeltalk about in their Authentic Voice interviews. We bring fear, ignorance, and untested assumptions to every encounter. If unaddressed, those vision-limiting traits will narrow the range of stories we’ll tell, frame those stories perpetually in familiar—and sometimes inaccurate—ways, and reveal in the language of the story the biases we’ve brought to the newsroom. We do the work of diversity because those individual limits live on. * News organizations are often arranged in a way that makes it difficult for some people to get their stories told. An overreliance on institutions—school boards, city councils, zoning commissions, police departments—leaves less time for covering the public and fewer opportunities for developing sources in under-covered communities. If much of the daily storytelling derives from press releases, press conferences, scheduled meetings, or the police scanner, what becomes of the people who aren’t electronically connected, civically engaged, or inclined otherwise to summon reporters to their communities? Had Gabriel Escobar not been reporting specifically on immigration matters, his Washington Post story “The Other Pro Soccer” might never have made it to print. We pursue diversity because coverage patterns continue to leave people out. * Even if the individual journalist is self-aware and the organization inclined to seek out a more complete report, societal factors can thwart the best intentions of diversity. Across the United States, segregation holds on stubbornly in the places we play, pray, learn, and live. Shopping malls, nightclubs, playgrounds, and movie theaters all bear evidence that people continue to separate themselves from one another. Police departments still pursue crimes differently depending on the class or race of victims and suspects, setting skewed priorities for unwary journalists. The public relations director at the local hospital may still think “man” when a reporter asks to speak to a doctor. So a journalist may embrace the idea of seeking out diverse views while reporting on the issue of prayer in the schools. Her newsroom may encourage staff to get past official sources and familiar neighborhoods to include a wider swath of the public. But if she doesn’t account for the segregated nature of schools, neighborhoods, and houses of worship by choosing multiple venues for reporting, she will likely wind up leaving out whole groups of people. If the police reporter doesn’t pursue stories beyond press releases and press conferences, all his best intentions to report fairly will be sabotaged by the biases of the police department. We pursue diversity because the society we live in still makes it necessary. 1. Select a day’s newspaper, Website, or broadcast for review. Who’s in and in what ways? Who’s out? 2. Bring to class examples of where journalists have succeeded and failed with inclusion, covering the under-covered, and mitigating bias and prejudice. 3. Choose a significant story about race/ethnicity. How do you think the individual, organizational, or societal forces described in this chapter influenced coverage of that story? Journalism makes a promise to provide the reading, listening, and viewing public with the information they’ll need to make good decisions in this democracy. Journalists can’t keep that promise if the picture they’re providing is chronically incomplete. Paying attention to diversity yields better journalism. Two oft-cited federal commissions — the Hutchins Commission and the Kerner Commission —separated by twenty-one years, concluded that the media skewed the picture of life in the United States by failing to report more fully on racial and ethnic minorities and the poor. Journalism has improved, and delivery modes have evolved from lead-type printing to cell phone text messaging. But the mission remains steady. “The primary purpose of journalism is to provide citizens with the information they need to be free and self-governing,” veteran journalists Bill Kovach and Tom Rosenstiel wrote in The Elements of Journalism: What Newspeople Should Know and the Public Should Expect (Crown 2001). They go on to say, “The news media help us define our communities, and help us create a common language and common knowledge rooted in reality” (p. 17). In their book Racism, Sexism, and the Media (Sage 2003), authors Clint C. Wilson II, Félix Gutiérrez and Lena M. Chao assert that the “obligation of news media to provide information and interpretation of issues and events to society is essential to the development and maintenance of an enlightened citizenry” (p. 125). If journalism is to live up to those lofty ideals, it can’t matter whether people avail themselves of the media or ignore it, make it easy or difficult for their stories to be told, have the same culture or skin color as the majority of the audience, or represent the demographic target advertisers seek. By pursuing diversity, we honor the principles of ethics as well as the critical role of the media that is enshrined in the First Amendment.